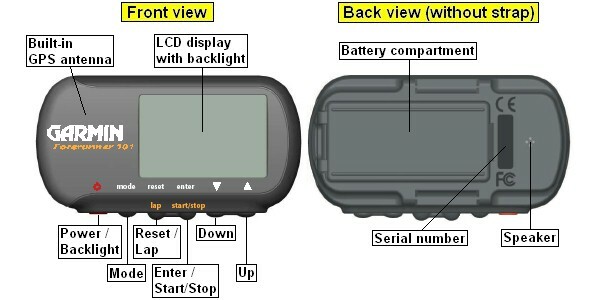 Small wrist top GPS receiver with easy to read display. As a personal training assistant, the GARMIN Forerunner 101 records the travelled path (track), distance, time and pace/speed, computes the calories burned and helps to achieve your personal workout goals. The device is very easy to use, supports multiple languages and has an extremely sensitive antenna. It is the perfect partner for any outdoor activities. The Forerunner 101 is especially well suited to provide information about your outdoor activities (track, speed, maximum speed, distance, elevation profile, time a.s.o.). Use the function "mark waypoint" to get the coordinates of the current location. The device also shows the current location in relation to user defined waypoints. 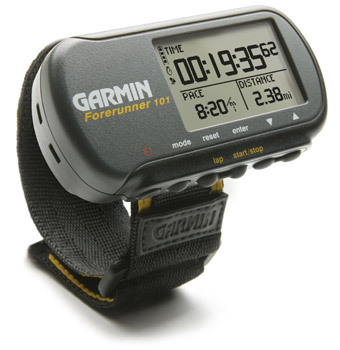 GARMIN Forerunner 101: This model has been discontinued; however, you can still order options for the Forerunner 101. All options for the GARMIN Forerunner 101 in detail. Here we provide additional documentation and software updates related to the Forerunner 101.